We are proud to offer high quality service dog training in Arizona that provides reliable canines to wonderfully special adults and children with many unique abilities throughout the nation. Working out of our state-of-the-art facility, we provide service dog training in Arizona to puppies as young as 3 weeks of age. We also regularly visit animal shelters across the state to adopt dogs that naturally demonstrate the demeanor to become outstanding lifelong people helpers. We welcome you to contact us to discuss how our service dog training in Arizona can benefit you, or with any questions you might have. If you would like to learn more about our autism service dogs, please click here. We also welcome you to contact us to discuss how our service dogs for autism can help enrich the quality-of-life for you or your loved one. If you would like to learn more about our service dogs for PTSD survivors, please click here. We also welcome you to contact us to discuss how our service dogs for PTSD survivors can help bring comfort and care into you or your loved one’s life. 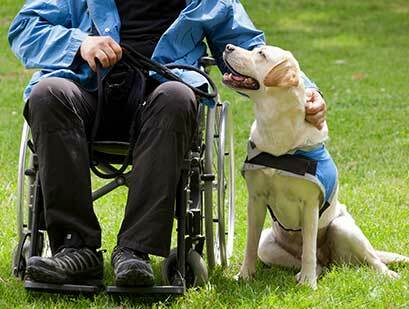 Please contact us to discuss how our service dogs for the hearing impaired can help you or your loved one live a strong, independent life. Please contact us to discuss how our service dogs for blind people can help empower you or your loved one to live an independent life. We do not like the use the word ‘disability’ around here, but we definitely love it when people tell us our mobility service dogs make their disability appear to be invisible! Please contact us to discuss how our mobility service dogs can help assist and bring joy into your or your loved one’s life. Please contact us to discuss how our medical alert K9 service dogs can help protect and serve you or your loved one. Our animal assisted therapy dogs also help adults and children improve their interactions with family, friends and medical staff, manage their discomfort or pain, and even ease psychological struggle when eating or taking medication. We welcome you to contact us to discuss how our animal assisted therapy dogs can help enrich your or your loved one’s life…. as well as to discuss setting up an animal assisted therapy program.